The Australian Museum is coming alive again with Jurassic Lounge, the night-time playground for grown-ups. This edition is themed Robots vs Dinosaurs and features a host of games, live performances and surprising interactions scattered throughout the museum's every nook and cranny. Are you team robot or team dinosaur? 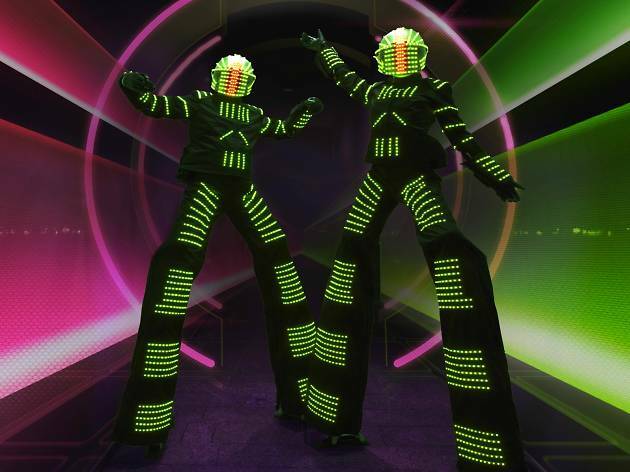 Pick your side and battle it out in the Silent Disco or on the Dancetastic Karaoke Stage. Lose yourself in an interactive ultraviolet galaxy of fluorescent colours and glowing bubbles in Fluoro-Light Fantastic and get fired up for your team at the Sumo Battle Bot arena. 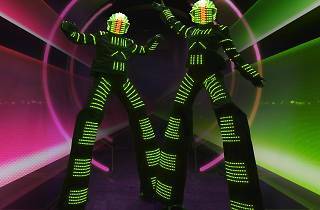 Boogie down with a posse of ten-foot tall robots and dinosaurs at the Dancefloor Clash of the Titans. Take a trip into the surreal and unknown in the very mysterious Peep O Rama. And feast on the plentiful food and drink options available throughout the museum. Jurassic Lounge's infamous Dating Roulette also returns – get matched up for a commitment-free, ten minute dating experience. Other activities include Dino Digs, Shadow Creature Crafts, and interactive Robo/Dino Exoskeletons you can wear and take for a walk through the crowd. Tickets are available via The Australian Museum and can be booked online. Get in quick –these parties sell out fast.